This post is Part 1 in my new Organic Gardening Series. 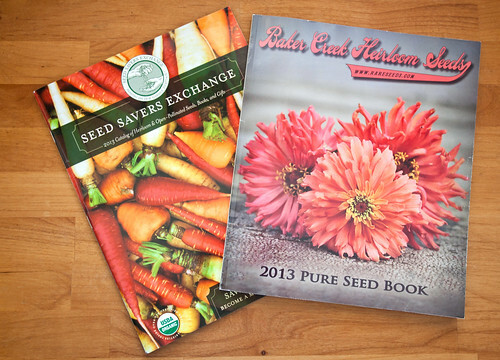 The days are getting longer, and hopefully warmer, which means it’s time to start ordering seeds for your garden. When looking for seeds, you will find that seed companies can vary greatly in quality. After starting seeds from many different companies, I can honestly say that I’ve had the very best luck with seeds from smaller companies. Baker Creek Heirloom Seeds is absolutely wonderful; they are a small family owned farm in Missouri. So, you’ve got your catalogs, and you’re ready to decide what to order. It’s important to know what can easily be started from seed in your area, or if it would be best to purchase transplants. This is something that I always have to consider, being in zone 4 with a short growing season. It’s important to know how long your growing season is, and to consider how long each plant will take to produce. If you’d rather not start seeds indoors, then make sure you’re only ordering seeds that will do well to direct sow in your garden. In Minnesota, there are certain things that I cannot grow by direct sowing. Tomatoes, peppers, and eggplant are a few examples. If I didn’t start these plants from seed myself, I would have to go to my farmer’s market and purchase transplants for them because our growing season is too short. Tip #1: Know your Terminology: Heirloom, Hybrid, Genetically Modified (GMO), Determinate, Indeterminate, etc. etc. Heirloom seeds have been around for generations, and are the most reliable if you intend on saving seeds from your garden. They are the most likely to give you viable seeds that will produce plants that are the most genetically similar to the parent plants. Hybrid seeds will give you child plants produced from the cross pollination of two different plants. Often times these hybrids are purposefully bred to gain the most beneficial characteristics from the two parent plants; disease resistance, better productivity, etc. Genetically Modified seeds are seeds that have been genetically engineered in a lab to have specific properties. This is very different from hybridization because they can combine genes from two completely different plants that could never naturally crossbreed. Doing this can actually damage the DNA of the plant, and create unwanted (and potentially harmful) genetic mutations. This means that the genes of the original plant may change the way they function, possibly activating genes that can trigger allergies, or even create specific biological toxins. Moral of the story: try to avoid GMO seeds. Determinate and Indeterminate are terms that you will most likely come across when looking for tomatoes. So, which type of tomato plants should you get? Determinate or indeterminate? Well, that depends on your garden, and the answer could easily be both! So what’s the difference? Determinate tomato plants are generally more compact. The plant will stay more bush-like, and will bear it’s crop all at once. Determinate varieties are better suited to containers, so they would be the best choice if you’re garden is on your patio. Another thing to note with determinate varieties is that you should NOT cut off the suckers of the plant, as doing so could stunt it’s growth. As for indeterminate varieties, they are pretty much the exact opposite. They will grow large and vine-like, while producing fruit throughout the entire season. Because they get so big, they will likely need more staking than determinate varieties, and also do well when the suckers are cut off. At this point, you should have a very general plan for what you want to plant in your garden. It’s important to know how much you can expect to fit in your garden, and how much of each plant you’ll have space for. If you’re an experienced gardener, this will be fairly easy, since you’ll already have an idea of what will go where, etc. If this is your first time gardening in a specific space, I would recommend staying tuned in for the next post in this series, which is going to be all about Garden Planning! Last year I tried Quinoa, and this year I’m trying out several new things. Chinese Noodle Beans, for instance. I’m pretty excited about those, and I also plan to grow Bok Choy and Kale for the first time. I also found a variety of Canteloupe called the Minnesota Midget, that I’m going to try growing, as they are a small, shorter season variety. I found a fantastic pin on Pinterest about how to grow melons in cool climates. With these tips, you should be ready to order your seeds. I almost never use all of my seeds in a year, so don’t be afraid to ask a friend to go in on your seed order with you! Also, don’t forget to read reviews and do a bit of Googling if you’re unsure of a certain seed type. Or comment here, and I’ll do my best to help you out! Previous PostOn Joining a CSA: and Bonus Salsa Recipe!